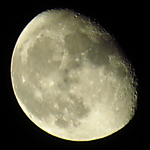 Moon test. With zoom at 30x, you need a tripod to make sure you get a steady shot even at higher shutter speeds. WB on auto. Saturation enhanced to 20% on computer to get a more natural image. This is a camera with a retractable lens that you can fit into your pocket and still give you reasonable shots.